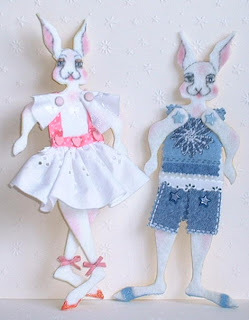 Using the template for this month's MAD MAMMA swap I made two more jointed paper bunny dolls which I shall give to my niece and nephew at Easter. They were both covered with white felt and highlighted with some pink chalk and their features drawn in with a Sharpie pen (plus a little Stickles highlight on the eye lids). Their clothes are made from fabric scraps and the limbs attached with an assortment of brads. I just need to buy some Easter eggs now to go with them! I've been altering some more scrabble tiles. I made two into a pair of earrings for my sister. They were covered with scrapbook paper, edged with some stickles and UTEE'd all over. There is a different image on the back. I hope she'll like them! 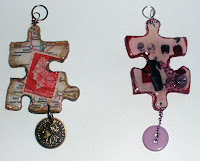 Then I made some more into charms - this time for a Flickr group called 'Altered Dominos & Other Altered Game Pieces' . This is a fantastic group run by JoAnne AKA 'takeabreak' and there is just about everything you need to know about altering game pieces on there as well as loads of tips and free images to use. 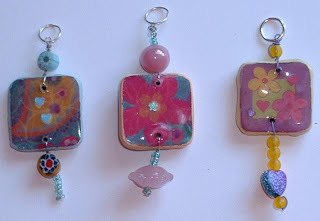 The three charms I made were for a 'Spring' themed swap. They didn't turn out quite how I expected as the scrapbook paper I used for two of them was double sided and once covered with UTEE it became transparent so the underside showed through! The colours were also darkened in the process. My initial thought was to scrap them but with the addition of the beads I think they look ok. I painted around the edges with acrylic paint and added some small gems before UTEEing all over. They look retro to me and a bit like little sweets! I only hope they will fit the 'Spring' theme. The photos show the front and the back. 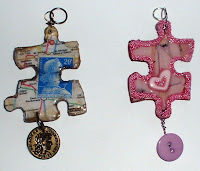 I've been busy making charms from old scrabble tiles this week as that's this month's project over on GAS MAMMA on Flickr (GAS meaning group for altered art swaps). Last month I was lucky enough to get drawn with Pattie and received her beautiful altered CD which you can see here. 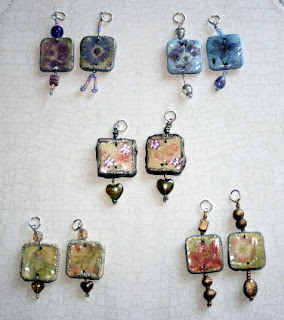 As I said above, this month's project (which co-incidentially was chosen by Pattie) was to alter some scrabble tiles into charms and the theme was flowers. Although we have a set of scrabble I didn't want to attack that as we do play it sometimes (although I can't remember when the last time was!) 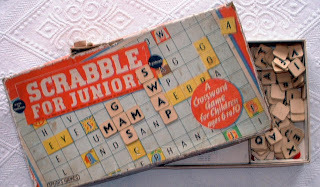 so I bought a very old 'scrabble for juniors' set at a car boot sale last Saturday. I didn't realise until I got it home though that all the tiles were made from cardboard and not plastic as I was expecting - doh! However, by glueing two together they become quite sturdy and good for altering. I used K & Co scrapbook papers for the flower images and sealed them with UTEE, apart from the middle set which I edged with UTEE from the melting pot, then sealed with Anita's 3D Clear Gloss Finish. To some I added tiny seed beads and gems. The best bit is finishing them off with some dangling beads. I'm pleased with how they've turned out and hope the receipients will like them also. 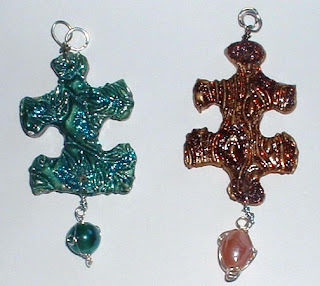 I'm going to make some more - and two will become earrings for my sister, Kelly who when she saw the charms today said they looked just like earrings and asked me to make her some! That really was a great compliment and it will be a pleasure to make them for her. (The photos show the front side (top) and the back - closer up pictures are on my Flickr photostream - see link at the side). 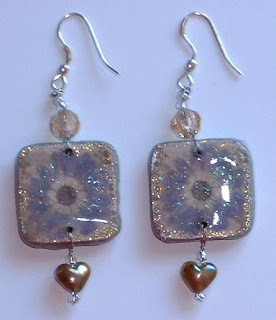 Yvonne's theme was 'Memories' in muted colours of our choice. 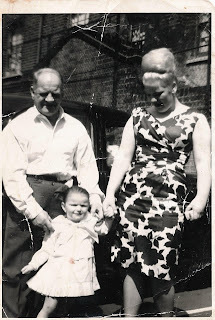 I found an old black and white photograph of me aged about 3 (I think) with my aunt Vicky (Mum's youngest sister) and my maternal Grandfather (Bert was his name and he liked a bet and a fag and had a cauliflower ear from his boxing days!) This picture was taken in the grounds of the flats my Nan and Grandad lived in (Bethnal Green, east end of London) and must be one of the few family photos that exists of that time - early 60s. I have a rather pained expression on my face (didn't like my photo taken even way back then - lol), I think it's due to it be a sunny day - it looks as though we're all squinting too! I love my aunt's beehive hairstyle and boldly patterned dress in this picture - so 1960s and very befitting of her big, beautiful and flamboyant personality! She lives in Spain now but we're lucky enough to go and see her and her husband every year and have a swim in their pool! As soon as I get the remaining pages and my own first page of the journal back, I will bind all the pages together - I have already made the front and back covers for it - and then I'll post a picture of it. Oops forgot to say what I did for this page! 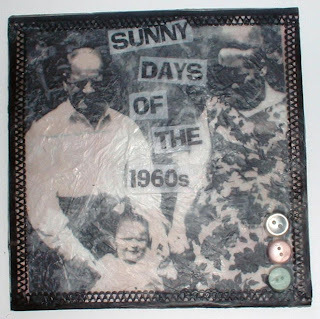 Another beeswax collage - a copy of the photo layered onto lightly inked card, then some layers of tissue and the text - some black paper lace around the edges and finally some buttons to finish it off - the white one representing my Grandad - for the white shirt he's wearing, the green one for my aunt as that's her favourite colour and the pink one for me as I'm a sweet little girl in the picture - say aaahhh! This week's challenge on June's Art Freebie blog was to use an image of some papyrus. 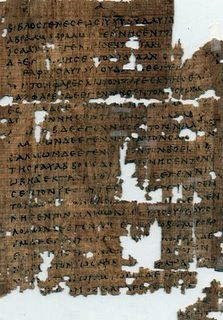 I knew papyrus was a type of old paper but I looked it up and discovered that it is 'thick paper-like material produced from the pith of the papyrus plant and first manufactured in Ancient Egypt'. With this in mind I decided the use the image as a background to the Egyptian Pharaoh 'Amenhotep' (yes, I looked that up too - lol!). 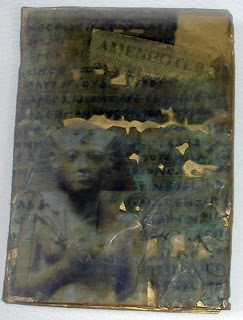 So it's a beeswax collage - the first layer is dark gold coloured tissue, then the image (after cutting parts of it away), then the Pharaoh and his name (covered again with some of the tissue to cover up the white paper) - all adhered with the beeswax and finally some gold ink around the edge to give a slight border. It's turned out a bit green due to my printer ink running low - I quite like the effect though and it blends with the dark gold tissue. I've now completed all six pages for the bird journal jam swap. This last one being my own. 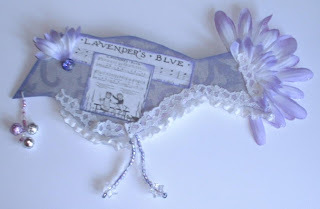 I chose the theme of 'Lavender and Lace' (any interpretation) and colours lavender, lilac, cream and white. I did it similar to the pages I made for the others in the swap - one side scrapbook paper and the other inked, versamarked and mica powders. I collaged a couple of scraps on it - one being the sheet music of 'Lavender's Blue...dilly dilly...'. I found an old lavender and white flower in my ribbon box (I've had it for ages and never found a use for it before), and when folded in half it became the perfect tail piece for my bird, and the inner petals became the eyelashes. 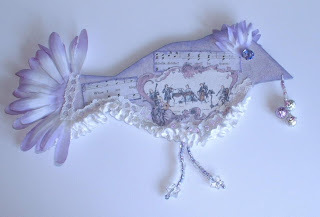 I finished the bird off with some white lace and beads - and not forgetting the little metallic bells hanging from the beak. Once I have all my pages back from the others in the swap I'll bind them together somehow and will post a picture of the complete journal. tweet, tweet!!! 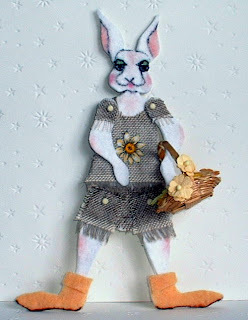 That's not a mad Easter bunny - but an Easter bunny being the themed doll over on this month's Monthly Art Doll Flickr group - the template is there too. I love these doll swaps and was lucky enough to get Margaret's doll last time which you can see here. 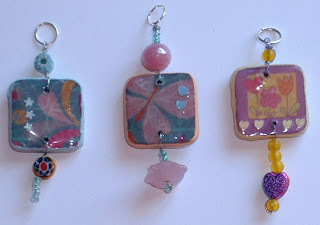 Art Freebies is a new blog created by June who each week is going to post a freebie image for us to use in a challenge - we can make anything and in her words "as long as you use this image in your work in some way. 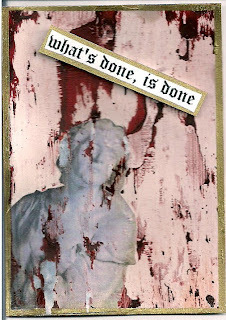 ATC'S, COLLAGE, CARDS,TAGS, ALTERED ART, DIGITAL, ABSOLUTELY ANYTHING"
The freebie image this week is of Lady Macbeth. I have made a simple ATC by first sticking on the image then making a 'peeling paint' effect background using petroleum jelly and acrylic paint (smear on the jelly, then paint straight over the top and once the paint is dry, wipe over with a dry cloth and the jelly acts as resist.) 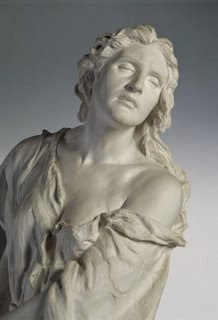 The quote 'what's done, is done' is from Macbeth (Act 3, Scene 2)and was said by Lady Macbeth to her husband who was distraught after having murdered King Duncan at her instigation. I thought the red peeling paint effect represented all the blood shed in the play. 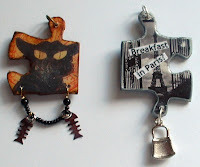 Trudy is hosting a 'Jigsaw Charm' swap over on DoCrafts which ends on 31st March. Here are my offerings. The jigsaw pieces are all from old puzzles and measure approximately 2" x 1 1/2". They have all been collaged and had a glaze applied. The Paris one was UTEEd. There are two photos of each, one showing the front and the other showing the back. I ran out of space to show the back of the African one, but it is painted with metallic brown and glazed with some beads added. I think I'll be making some more of these! 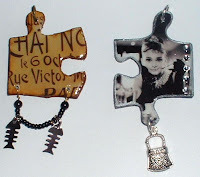 Here are a couple more jigsaw charms for Trudy's swap. These are thicker jigsaw pieces being made of wood. I applied to them pigment ink, UTEE, a bit of glitter and rubber stamped into them. 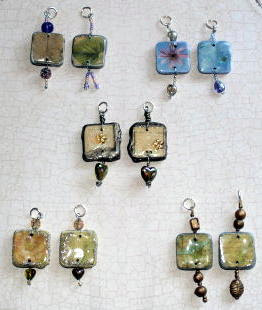 I've enjoyed making all of these charms and am looking forward to getting some back from the other participants of the swap. Nice one Trudy!! 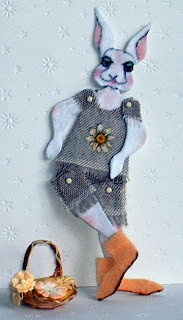 There is a new altered art group over on Flickr called GAS MAMMA, MAMMA being Margaret and GAS meaning Group Altered Swaps - or something like that! The idea is each month a new project will be chosen (from ideas of members of the group) and at the end of the month partners will be drawn (randomly) so the altered items can be swapped. For the first month Viv has chosen as the project - 'ALTERED CD with an ORIENTAL theme'. Well, I've never altered a CD before so this was the perfect opportunity to try! Some time ago I bought a tube (the type a rolled up poster might go in) which was decorated with oriental gold foil and had a decorative tassel on the end - there, I knew it would come in useful one day! I peeled off the foil and detached the tassel and attached them to a CD. Before doing so I removed the centre from the CD and edged it with some beads (an old necklace from a Barbie doll - sshhh, don't tell my niece!). For the back of the CD I painted it gold (using metallic acrylics from Ranger) and attached some oriental images. 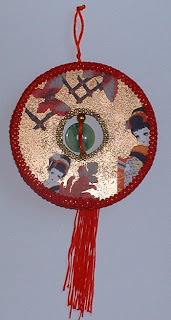 I also edged the centre with plain gold beads. Around the outer edge of the CD I attached some red braid. 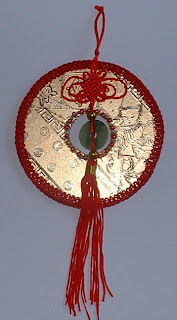 As there is a hole in the middle of the CD the 'jade' disc attached to the tassel can be seen from both sides. That's it, finished, maybe if I do another one sometime I can be a bit more adventurous! I'm calling this 'Good Luck, Wealth and Happiness' as the colours red and gold represent these things in Chinese culture.